Nine new graphic cigarette warning labels were unveiled by the Food and Drug Administration (FDA), which recently got powers to regulate tobacco and tobacco products. Cigarette packages will now carry one vivid color image and one of the below warnings about the consequences of smoking. The warnings will cover the upper portion of the pack both front and back. Fifty percent of the package must be covered. The Cigarette packet will look like below one once after implementing this warning labels. Dead bodies, diseased lungs and a man on a ventilator were among the graphic images released by the FDA officials. FDA statement says, "These labels will encourage smokers to quit and prevent children from smoking. President Obama wants to make tobacco-related death and disease part of the nation's past, and not our future." According to the Centers for Disease Control and Prevention, about 443,000 people in the U.S. die from smoking or exposure to secondhand smoke annually and more than 8 million are living with a disease that's directly tied to smoking. The CDC says smoking is responsible for 90% of all lung cancer deaths in men. 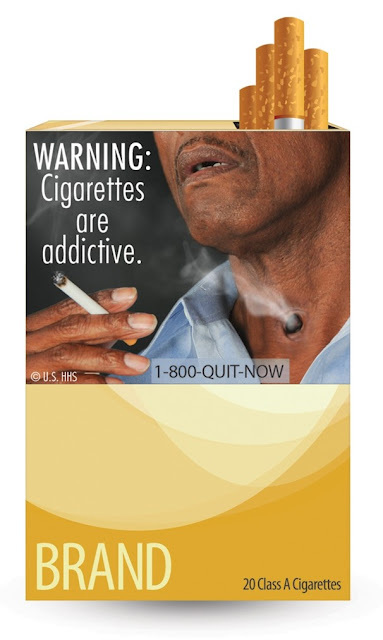 The 2009 Family Smoking Prevention and Tobacco Control Act called for cigarette packages to include warning statements in large type covering half of the front and back of each package and graphic images showing adverse health effects from smoking. Smoking causes lung diseases such as emphysema, bronchitis, and chronic airway obstruction. About 90 percent of all deaths from chronic obstructive lung disease are caused by smoking. Secondhand smoke can cause serious health problems in children. Children who are exposed to secondhand smoke are inhaling many of the same cancer-causing substances and poisons as smokers. Quitting at any age and at any time is beneficial. It's never too late to quit, but the sooner the better. Quitting gives your body a chance to heal the damage caused by smoking. You can watch below video to see the nine labels issued by the FDA. "The anti-smoking message is not intended to provide information that smokers and potential smokers can consider rationally in weighing the risks and perceived benefits from smoking. Rather, it plainly conveys -- through graphic images and designs intended to elicit loathing, disgust, and repulsion -- the Government's viewpoint that the risks associated with smoking cigarettes outweigh the pleasure that smokers derive from them and, therefore, that no one should use these lawful products." With this new move, the United States will be the 40th country to have picture warnings on cigarette packs, making the country compliant with the World Health Organization's global treaty on tobacco. Under the treaty, 35% of a cigarette pack must have warnings and pictures. Canada started using "warning labels" like this in 2000. Since then, number of smokers went down 20%. Images used on cigarette packs in countries such as Canada are so disturbing that some smokers buy covers for their cigarette packs to block out the images.